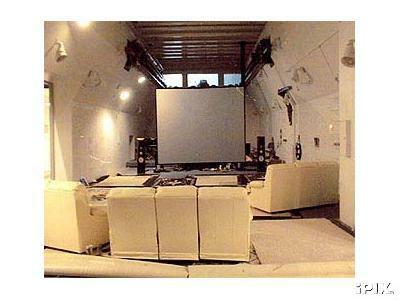 An auction just ended at eBay of an old ICBM missile silo, re-fitted into a rather unique luxury home. Sounds like a lot of fun. Who wouldn't want a 47 ton garage door for one thing. I always dreamt of living underground. Anyway, it sold for $1.5million, and there are a whole lot more of these in Kansas. "BUILT TO WITHSTAND A NUCLEAR BLAST!! Most highly developed Atlas E site in existence. A total of 16,000 sq. ft underground floor space, intensively cleaned & painted. 4,000 sq. ft. Launch Control Bldg. refurbished into living space that includes: marble bath complex ($250K spent) with high ceilings, heavy beams, red cedar wood, marble walls and tile floors, 1100 gallon tiled hot tub, sauna, domed 4-head shower area with glass brick. Total of 3 finished baths, new kitchen, 3 large carpeted living areas. 11,000 sq. ft. industrial or commercial floor space in former Launch Service Bldg. has 47 ton drive-in door that operates electrically, 3 main rooms with industrial or commercial potential, extensive electrical upgrades, 4 Liebert air handling units plus geothermal system, generator shack, 66,000 lb. bank of batteries, 12 line phone system,chemical and bioligical air filtration. On 28 acres with Â½ mile paved driveway, high chain-link fence around central complex with electric rolling gate and remote control key punch codes. Two 4,000 sq. ft. metal buildings on surface (one 1999 built, 1 original quonset). 15 new (clean tested) water wells, water pumping windmill, fruit, nut and pine trees (1997 planted). 2 sewage disposal systems. Phase I environmental testing completed. Unique, historic, functional property. . "
I think the potentially very cool thing about underground living is that we could keep practically ALL of the earth's surface as a wilderness. As a matter of fact, that's how I think it should be. There's really no good reason for humans to cover all the land, paving it all over with roads and housing and mono-culture farming. We can do all of that underground. 28 Jan 2008 @ 05:17 by drew @69.20.183.82 : Farming underground? BTW, I think the total populated area of the earth is less than 2%, and not increasingly rapidly. There is no shortage of livable space on the surface of the earth, and won't be in the near future. People think that there is because the majority of the population in developed countries live in cities, and see the expansion of those cities. What they DON'T see is the hundreds of millions of square miles of undeveloped land...why don't they see it? Because it's undeveloped (and roadless). Look at central Canada or Siberia on Google Earth, and tell me we're 'running out of space'. Crop yields have increased dramatically in the past two centuries, resulting in the largest per capita food supply in the history of mankind (inequitable distribution is the reason for hunger, not a limit of supply), meaning we've been producing (in some cases) triple the food per acre of just half a century ago. That being said, I think underground living (at least partially underground) is a great idea. Why build houses out of wood, which is not only a limited resource, but flammable, not tornado proof, and must be heated and cooled constantly. A house with thermal mass, in the form of large amounts of soil, requires much, much less fuel to heat and cool, not to mention being storm proof, fire proof, and much more sound absorbent than the average stick home. Houses underground is a great idea, but farming underground is not (IMO). 28 Jan 2008 @ 05:41 by bushman : Tech. We have the tech to grow crops underground, we also have the tech to control Radon gas, probably the biggest problem with living underground would be the Radon gas. Still we have to look at deforestation, and fuel to transport the foods, but normaly its the good farm land that gets paved over with citys. Plants can be taught to grow without light, or very minimal light. Most foods are not necessary to eat. The 'amazing' crop yield is from genetically modified crops that enslave farmers, and the crops are mainly used to make poisons. Living underground would make one feel stealthy, wealthy, and healthy. People that are afraid to live underground or close to the earth, are a burden. if eco convinces the masses we are over populating the earth and pass laws to stop the S P R E A D of humans, then all the masses will live in cities. If I turn my herd on to 100 acres, eventually they will wander off over the entire acres. That means they will get their food where ever they want and won't come when I call them up, even food want entice all of them. But! If I keep the herd on 10 acres. I can use the other 90 acres, and it's resources, as I please. It doesn't take as many personell to control them and I bring the food to them when I want to. It's a business model even the government can use, it'll work quite well. Get my drift? My father would speak of living underground when I was a kid, 30 years ago. I've always felt some sort of "pull" to be below ground. My great-grandfather was a Welsh coal-miner; perhaps it's genetic. When I was in the military, I never felt comfortable inside the tank; I always felt like the first thing I would want to do is jump out and dig a hole, should we come under attack. There are also "sky people"; people that feel most comfortable living high in the air. I'm not. I feel most comfortable below the ground; the deeper the better. I'm not the only one, and would like to connect with othters that feel as I do. Advances in technology may make it possible for true underground living for the extreme long-term. Also, as a means of "checking-out" of mainstream society. The modern-day equivalent of the "New World" the Puritans were seeking, although my perspective is not religious at all. A self-sufficient and underground community can look forward to living on indefinately no matter what happens on the surface, while still retaining the advantages of remaining connected to the surface while advances in technology continue. The best of both worlds. Remaining connected if and where it is desired, and being completely disconnected as desired as well. I feel there should be a internet site - some kind of common "meeting point" or a forum where people like myself can meet, talk, ideas and possibly make plans. I'm fairly computer literate, and can provide some time in the creation & maintenance of such a forum, should anyone else be interested. (I don't want to be the lone "kook" in this endeavor, and it would be more effective to present the idea as a group effort, with the societal "checks & balances" that would go with it. Feel free to contact me via e-mail. It seems to me as though signing Anonymous and disappearing would provide a fair bit of difficulty in raising a community n'est-ce pas - especially if you're half a year late in replying? Feel free to email if any such forum finds itself existent, of course. FLAT-PIECE OF SURFACE ON TOP AND PUT A FUTURESTEEL.COM " BUILDING " ON " TOP " . When analytic for Chanel handbags at http://www.rfshoeoutlets.co.uk online, one of the age-old things you admission to accent out for is the Chanel logo. 28 Jul 2016 @ 07:01 by eldonkarl789 @125.162.250.17 : Thanks!